Downtown Cambridge hosts a special shindig to the GrooveFEST weekend with a kick off party and special exhibit, talk and film screening on Friday, October 20 from 6 to 10 p.m. The event will be hosted at 447 and will display a private collection of over 50 Globe Posters collected by John Lewis. The posters have become collector’s items over the years, becoming an important piece of the illustrated history of American music, especially iconic of African American music during the 50s and 60s. The reception will also feature a special talk presented by Mary Mashburn and Bob Cicero of the Globe Poster press and studio now housed with the Maryland Institute of Creative Arts (MICA) in Baltimore. For the first time a film produced by John Lewis documenting the history of the posters and their relevance in the American music history will be screened. Light refreshments as well as a cash bar will be available. Tickets are $20 in advance at downtowncambridge.org. Proceeds from the event help support the revitalization work of Downtown Cambridge, a Main Street organization. 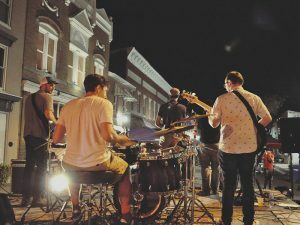 On Saturday, October 21, Downtown Cambridge will host its annual GrooveFEST: Blues, Brews and BBQs event along the 500 block of Poplar Street and the 400 block of Race Street between 5 and 10 p.m. The event is a music festival featuring four groups performing that night on two stages, including Hoppie Vaughan and the Ministers of Soul, Josh Christina, SoulTET, and The Evolution Band. Back again this year is a set of young performers forming the group SoulTET. This vivacious, energetic, and soulful band out of Baltimore has roots in Funk, R&B, Soul, and Jazz. Hoppie Vaughan and the Ministers of Soul are a rhythm and blue-eyed soul performance. Fans and other musicians know that Hoppie Vaughan’s inspiration and influence has been a major catalyst for the growth of Roanoke’s live music scene, which is getting bigger and better every year. In April 2018, Hoppie and the Ministers of Soul opened for the James Hunter Six at the Harvester Performance Center in Rocky Mt, Virginia. He has also performed or appeared with Delbert McClinton, Rod Price of Foghat, Mac Gayden, Tommy Two Tone, Jimmy Hall of Wet Willie, Ronnie Milsap, Wayne Perkins, Tommy Castro, Tab Benoit, John Mayall, Sonia Data, Goose Creek Symphony, Gatemouth Brown, Miranda Louise, and The Kentucky Headhunters, among others. Josh Christina is described as modern rockabilly and has been described as a mixture of Elvis, Chuck Berry, Jerry Lee Lewis and Elton John. “Josh Christina is the future of Rock’n’Roll folks. He plays it the way it was meant to be played. How this 21-year-old musician plays with the soul of Ray Charles, the piano with the feel of Jerry Lee Lewis, the energy of Elvis Presley and the rhythm of the legendary rock n’ roll guitar player, Chuck Berry, who all had their biggest hits before he was born, in fact, before his parents were born, is beyond me,” said Daryl Davis, of Blues Musician. Back again this year is a set of young performers forming the group SoulTET. A young vivacious, energetic, soulful band out of Baltimore with roots in Funk, R&B, Soul, and Jazz. This group is guaranteed to get everyone dancing. SoulTET is inspired by Tower of Power, Lettuce, Soulive, The Motet, Chuck Brown, James Brown, Earth Wind and Fire, George Benson, Stevie Wonder, and Herbie Hancock. Also joining the line-up in 2018 is local group The Evolution Band led by Cambridge native Gilbert Cephas. The Evolution Band performs Rhythm and Blues. The event is also a great chance to taste some delicious local BBQ, which will include several local BBQ vendors. A $5 donation at entry is requested to help support the revitalization efforts of Downtown Cambridge, a non-profit Main Street organization. Find more information at downtowncambridge.org or call 443-477-0843.